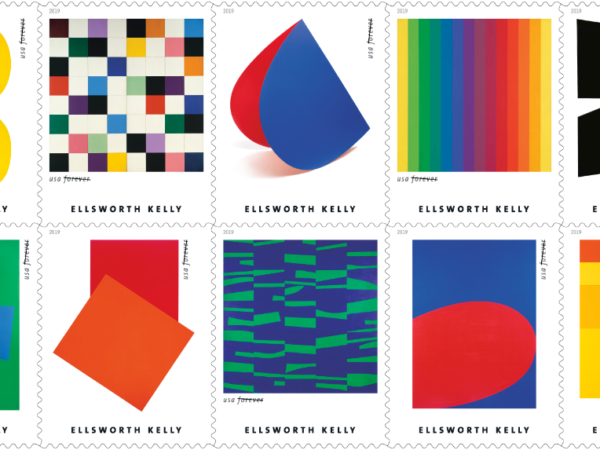 Stunning tribute to the artist Ellsworth Kelly (1923–2015). How beautiful are these USPS stamps? Kelly pioneered a distinctive style of abstraction based on real elements reduced to their essential forms. His artworks include paintings, sculpture and works on paper. The 20 stamps on the pane feature 10 pieces, each represented twice: Yellow White (1961), Colors for a Large Wall (1951), Blue Red Rocker (1963), Spectrum I (1953), South Ferry (1956), Blue Green (1962), Orange Red Relief (for Delphine Seyrig) (1990), Meschers (1951), Red Blue (1964) and Gaza (1956). A detail from Blue Yellow Red III (1971) appears in the selvage.